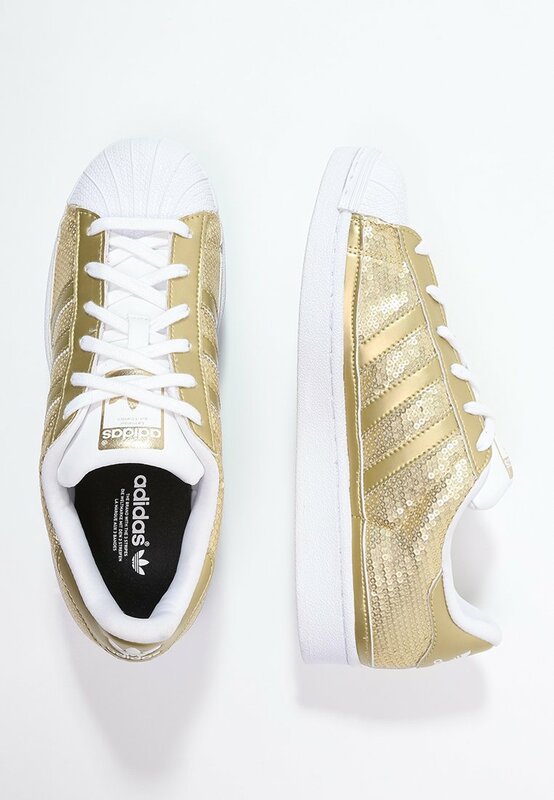 Gold, (gold) always believe in your soul (sole) …..
Actually I can vouch for the fact that Adidas Superstars are indestructible. I’ve got a pair that are 12 years old now – they’ve got paint on them from where I painted a playhouse pink and one lace is shorter than the other where I chopped it off with the shears when gardening. Moving on though, the re-launch of Adidas Stan Smiths a while back now gave Adidas a new lease of life and Stan Smiths, together with Superstars, are the go to trainer of the moment. 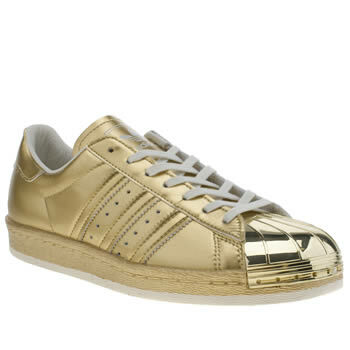 And right now gold trainers are definitely having a moment. Being the magpie that I am – and quite possibly a slight sheep too – I can see how a pair would work. I did several hours of Christmas shopping today and what better way to grab myself a ten minute sit down than by trying trainers on? Well I’m not really a coffee kind of girl and it’s nice to “achieve” at the same time as resting. First up, Adidas Superstars in liquid copper (£69.99). Well they’re definitely gold, that’s for sure. I’m not quite sure what I think about the contrast between the gold and the white toe. Too much? Maybe. The jury is out for now. Moving on to the Adidas Stan Smith gold (£69.99) – I was surprised but I didn’t like the look or feel of these, despite having a white and red pair that I love. They felt low to the ground, the leather didn’t feel like leather and I thought that they looked a bit like Grandma type shoes. (Sorry Mum!) Stans don’t have the three Adidas stripes on the side but instead they have the holes which on the gold ones, just don’t quite do it. 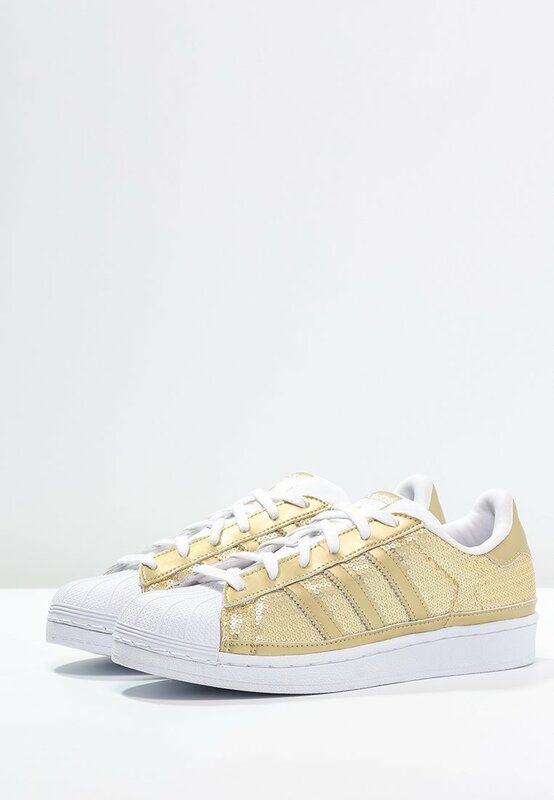 I liked these Superstars in white and copper (£69.99). But the fit wasn’t great. They kept slipping off at the back so they stayed in the shop. I also wondered whether they were a bit too subtle and perhaps not quite gold enough…. Oooh, where did you get them from? I haven't seen those ones in the flesh yet. Great that you love them! Is it just me that can't read the first part of your blog as the tweets come up over the top? Sorry Clare, I don't know why that should be although I know that others have said the same. I'll change the setting and see if that helps. I view the blog either on my phone or a lap top and it's fine but I'm not so sure about ipads. Anyway, let me see what I can do! And sorry. OK, I've done it now – is that any better?! Thank you! Sorry – please see above. I'll try and do something about it! Can't make myself like the toe on any Adidas trainers. God knows, I've tried, but it just doesn't happen. Love anything metallic and sparkly though.